2) Monsther Clown, Murder Clown, Psycho Clown b Máscara Año 2000 Jr., Psicosis, Texano Jr.
Air Date: 02/01 – nearly all of Naucalpan air this week, so they’ll air this one next week. 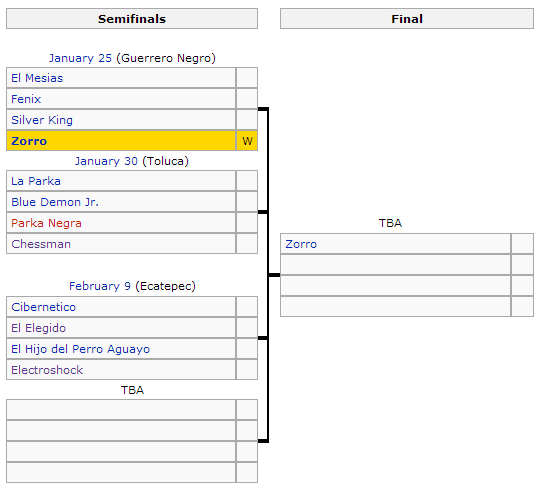 Zorro winning is a good idea; he needs something to do to get some momentum and advancing to the Rey de Reyes final gives him that. Nothing else worth nothing on this show. Dorian said they drew 6,000 people. Tickets were earlier announced as free, though AAA didn’t push that as much as their last couple free shows. They have a quick turn around to the next taping, Thursday in Toluca.